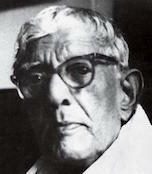 Jamini Roy was born in 1887 at Beliatore in West Bengal. In 1903 Jamini joined Government College of Arts and Craft, Kolkata. Abanindranath Tagore (Founder of Bengal School) was the vice principal. In 1908 he received his Diploma in Fine Arts. He was highly influenced and inspired by the Kalighat Pat (Kalighat Paintings) and between 1912 -1924 he began experimenting with the Santhal dance as his starting point to create his paintings in Kalighat style. This was a reaction against the Bengal school and western tradition style of art. In 1937 he exhibited at Samavaya Mansions, Kolkata. In 1938 Jamini had his first solo exhibition and his paintings were exhibited for the first time in the British India Street of Kolkata. In 1946 his works were exhibited in Burlington Gallery in London. In 1953 his works were exhibited in New York. In 1935 he was awarded Viceroy Gold Medal for one of his artworks. In 1955 he was conferred the Padma Bhushan by Government of India. In 1956 he was elected Fellow of Lalit Kala Akademi, New Delhi. In 1967 he was awarded honorary D.Litt. at Rabindra Bharati University, Kolkata. Jamini passed away in 1972 in Kolkata. In 1987 and 1990 he was exhibited in a group show ‘Centenary Exhibition’ at National Gallery of Modern Arts, New Delhi; Birla Academy of Art and Crafts, Kolkata and in Mumbai. In 1995, 2000, 2003 and 2005 he was exhibited solo and was showcased in a group exhibition in New Delhi. In 1997, 1998 and 2000 he had a solo and was showcased in group exhibitions in Kolkata, Mumbai and Florida. In 2004 and 2005 he was exhibited in group exhibitions at Lalit Kala Akademi, New Delhi and Jehangir Art Gallery, Mumbai. In 2008 he was exhibited at Philadelphia Museum of Art and Aicon Gallery in New York. In 2009 he was showcased in ‘Moderns and more’ at Aicon Gallery in Palo Alto and in ‘Kalpana: Figurative Art in India’ at Aicon Gallery, London. In 2009 he was showcased in Aicon Gallery in New York and Emily Lowe Gallery, Hempstead. In 2010 he was exhibited in a couple of group shows in New Delhi. In 2010 and 2011 he was exhibited at Aicon Gallery in New York and London. In 2011 he was showcased in group shows; New Delhi, Chennai, London, San Jose, New York and Singapore. In 2011 he was exhibited in ‘Time Unfolded’ at Kiran Nadar Museum of Art, New Delhi. In 2012 he was showcased in group shows in New Delhi and Chennai. In 2013 he was showcased in a group show ‘Panoplism’ in New Delhi and in 2015 he was exhibited in Kolkata.